As of today, “Avengers: Infinity War” is available on Digital HD (iTunes, Amazon), which means I’ve been able to update our gallery with over 250 high-quality blu-ray screen captures of Karen as Nebula in the 2018 Marvel blockbuster. It tells the story of the Avengers and their allies who must be willing to sacrifice all in an attempt to defeat the powerful Thanos before his blitz of devastation and ruin puts an end to the universe. The fourth installment of the ‘Avengers’ series is set to hit theatres in May 2019. 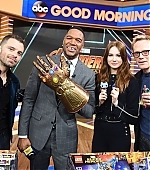 Yesterday (April 23), Karen attended the highly-anticipated “Avengers: Infinity War” Premiere in Los Angeles. She looked beautiful in Thom Browne Fall 2018 RTW. Over 85 high-quality images have now been added to our gallery. 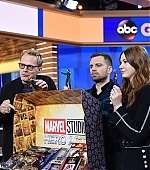 Back on Monday (April 16), Karen attended the “Avengers: Infinity War” Red Carpet Fan Event at Marina Bay Sands Event Plaza in Singapore alongside director Joe Russo, Benedict Cumberbatch, Robert Downey Jr and executive producer Trinh Tran. I’ve updated our gallery with several high quality images. 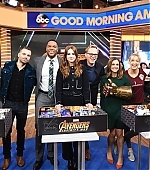 Earlier today (February 27), Karen and her “Avengers: Infinity War” co-stars, Sebastian Stan and Paul Bettany, visited ‘Good Morning America‘ to kick off the Marvel Universe Unites, a week-long charity event counting down to the reveal of all-new products and toys. For more information, click here. High-quality images have now been added to our gallery.